Laurentio is blessed with exceedingly dynamic movements. His fascinating presence and outstanding temperament round off the overall picture of this awesome stallion. Laurentio passed his stallion performance test with a score of 8.65 for rideability and left the test with the Reserve Champion title. 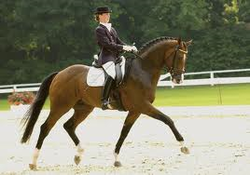 Along with first places in tests for young dressage horses, Laurentio also qualified for the Bundeschampionat in 2005. Height: 167 cm / 16.2 h.h.